The Life and Liberty Award was created to bring prominent national figures to New Hampshire who have demonstrated excellence and bravery in the world of human rights, civil rights and the law. The following are a summary of the Award recipients presented through this Series. Your membership support helps to fund these extraordinary events. On November 13, 2018, the NH Supreme Court Society presented a Life and Liberty Award posthumously to American Journalist James Foley, who was captured and later killed by ISIS rebels while he was reporting on the war in Syria. The award was accepted by James’ parents, Diane and John Foley. The Keynote Speaker was NPR’s Lulu Garcia-Navarro, host of “Weekend Edition Sunday” and formerly an NPR foreign correspondent. James Foley had a passion for journalism. His writings were often about the poor, disadvantaged, and suffering amid conflict. James spent his childhood growing up in Wolfeboro, New Hampshire. After graduating from college, James worked for Teach for America in Arizona for 6 years. With his passion for writing James earned a Master’s in Journalism from Northwestern University. James began his foreign correspondent career in 2011 in Libya reporting on the civil war for GlobalPost and other news organizations. A new assignment brought James to write and report about the Syrian civil war. James cared deeply about the victims of war, and the rights of people living under oppressive regimes. He was an old-school reporter, who traveled light, talked to the locals and put the story first. His conflict reporting — from Afghanistan to Libya to Syria — exemplifies the intrepid and selfless work of someone willing to risk his life so the world could understand the horrors of modern war. Four years ago, James was killed by ISIS militants. Held captive since 2012, James was one of several journalists, including a handful of Americans, who met their deaths at the hands of ISIS executioners. James’ death sent shock waves through American media and society. After James’ death, his parents created the James W. Foley Legacy Foundation, which advocates for the release of American hostages and supports freedom of the press throughout the world. Before joining the Sunday morning Weekend Edition team, Lulu served as an NPR correspondent based in Brazil, Israel, Mexico, and Iraq. She was one of the first reporters to enter Libya after the 2011 Arab Spring uprising began and spent months painting a deep and vivid portrait of a country at war. Often at great personal risk, Garcia-Navarro captured history in the making with stunning insight, courage, and humanity. 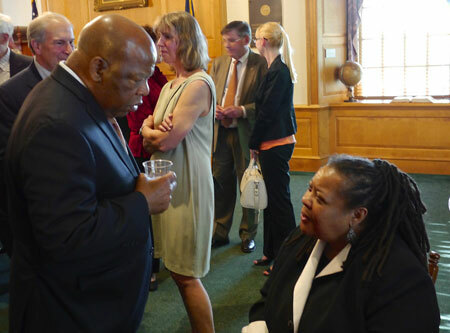 On May 18, 2012, Congressman John Lewis was given a Life and Liberty Award for his outstanding work on human and civil rights. In addition, an Award was also given posthumously to Jonathan Daniels, with Special Guest Ruby Sales in attendance. The event was held before a spellbound audience at the New Hampshire Supreme Court. Congressman Lewis, who has served in the US House of Representatives for almost three decades (Georgia’s 5th Congressional District since 1987), is well known as a key figure in the civil rights movement of the 1960s. He is considered one of the “Big Six” of the movement, and is the only surviving speaker of the March on Washington in 1963. He was a leader of the march on the Pettus Bridge in Selma, Alabama, and was among those beaten by police at the end of the bridge. He has had a distinguished career as a U.S. Representative, and continues to fight for human rights domestically and internationally. Born the son of sharecroppers in Alabama, Lewis grew up on his family’s farm and attended segregated public schools. As a young boy, he was inspired by the activism surrounding the Montgomery Bus Boycott and the words of the Rev. Martin Luther King Jr., which he heard on radio broadcasts. In those pivotal moments, he made a decision to become a part of the Civil Rights Movement. Ever since then, he has remained at the vanguard of progressive social movements and the human rights struggle in the United States. 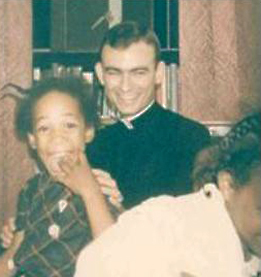 Jonathan Daniels is less well known, but was front-page news in August 1965, when he was killed in Alabama by a white man who shot at a group of white and black civil rights workers working to integrate public places and register black voters after passage of the Voting Rights Act. Daniels, a resident of Keene, New Hampshire, was an Episcopal seminarian who had followed the call of Martin Luther King, Jr. to support the civil rights movement. According to witness accounts, when a shotgun wielding construction worker and special county deputy turned his gun on the group and fired, Daniels pushed his fellow civil rights worker Ruby Sales out of the way and took the blast that was intended for her. He died instantly, and Sales and the other workers were able to escape, although one was critically injured by another shot. Thomas Coleman, who fired the shots, was acquitted by an all-white jury in the case. The result of the trial led to legal challenges and a reform of the jury selection procedures, which had long excluded blacks, first because they were disenfranchised from voting before 1965, then because of a discriminatory process in developing the jury pool. At the Life and Liberty Award event, Ruby Sales gave an inspirational talk about how that event changed her life. Sales went on to attend the Episcopalian seminary that Daniels had attended, and has worked as a human rights advocate ever since. Sales is the founder and director of the Spirit House Project and is one of 50 African Americans to be spotlighted in the new Smithsonian National Museum of African American History and Culture in Washington, D.C.
On December 2, 2009, with remarks by former President Bill Clinton before a packed courtroom at the New Hampshire Supreme Court, Congressman Tom Lantos was given a posthumous Life and Liberty Award based on his strong and steadfast dedication to international human rights. Lantos was a 14-term member of the U.S. House of Representatives from the State of California, and was the only Holocaust survivor ever to be elected to Congress. He co-chaired the Congressional Human Rights Caucus, which explored a wide range of human rights issues, including fighting for Christians in Saudi Arabia and Sudan to be able to practice their faith, helping Tibetans to retain their culture and religion in Tibet, and advocating for other minorities worldwide. 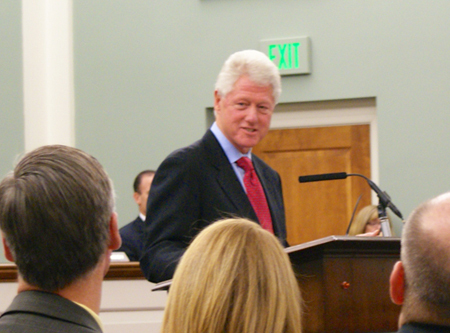 Accompanied by Congressman Lantos’ widow, Annette Tilleman Lantos, who accepted the award, and his daughter, Katrina Lantos Swett, President Clinton spoke highly of Lantos and his work. He and Lantos were longtime friends. In addition to being known as a strong defender of human rights, Lantos was an ardent supporter of Israel and an outspoken critic of Communism. He also worked for stronger protections for animals and the environment. It was his defense of human rights, though, that most clearly defined a Congressional career that lasted nearly three decades. That focus was an outgrowth of his experience during the Holocaust, in which much of his family, including his mother, perished. Mr. Lantos was a 16 year old Hungarian-born Jew when the Nazis occupied his native country in March 1944. He was sent to a labor camp where he escaped, was captured and beaten, escaped a second time and returned to Budapest. After the Russians liberated Budapest in January 1945, Lantos tried to locate his mother and members of his family, but he gradually came to realize they had perished. 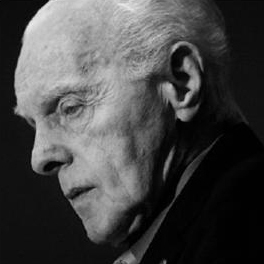 His experiences in the Holocaust and afterward were highlighted in the Academy Award winning documentary The Last Days (1998) produced by Steven Spielberg’s Shoah Foundation. 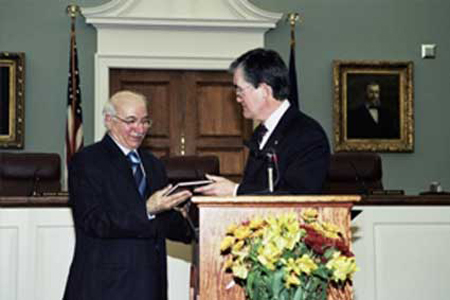 On November 13, 2006, Madhat al-Mahmood, the head of the Iraqi Supreme Judicial Council and the first and current Chief Justice of Iraq, spoke to a captivated audience assembled at the New Hampshire Supreme Court, where he received the New Hampshire Supreme Court Society’s first Life and Liberty Award recognizing his extraordinary judicial services to his country. Al-Mahmoud was born and grew up in Rusafa, Iraq, attending both primary and high school in Baghdad, before attending the College of Law at Baghdad University. He later was admitted to the bar, practiced law and also served as a reserve officer in the Iraqi Army. Following the 2003 invasion of Iraq, al-Mahmoud was made a supervisor, or minister, for the Ministry of Justice. In 2005 he was appointed as Chairman of the Federal Supreme Court as well as head of the Supreme Judicial Council, a body responsible for the oversight of all courts across Iraq.